This is a German clone of the Apple IIe. 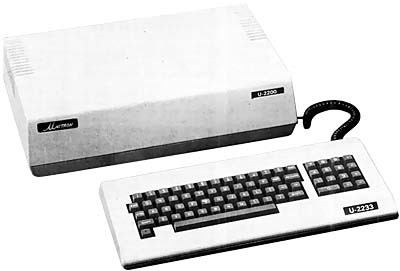 The keyboard of the UNITRON 2200 has built in macros, Applesoft commands and DOS commands. Very handy when doing basic programming. The only drawback is that the macro-key is the same key that changes from uppercase to lowercase and is also used when performing a reset. This results in constantly changing to lowercase when not wanting to. There are also two keys to make your own macros for the numeric keys. The drive controller and a Z80 CPU (for CP/M compatibility) are not optional but built in on the motherboard. When you boot the system, it says "DISK ON" instead of "APPLE ][". see more Unitron (Germany) 2200 Ebay auctions !